An upscale sedan U-Tapao Airport Limousine pulled up in front of my condo in Jomtien yesterday. I asked the driver for a business card. 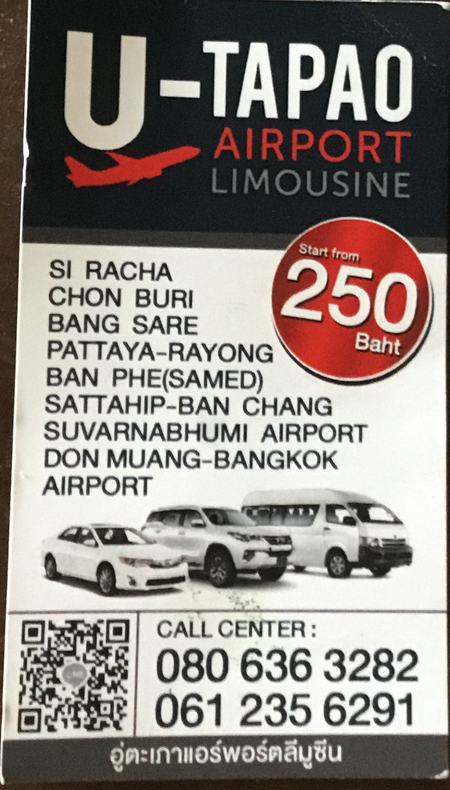 Si Racha, Chonburi, Bang Saray, Pattaya, Rayong, Ban Phe (Samed), Suvarnabhumi Airport, Don Muang (Bangkok) Airport. The card's also QR Code takes one to LINE, which I do not have. I failed to ask the cost from the airport to my building, so will eventually have to call. If anybody here calls, please post the information acquired.